This is a tiara (and accompanying parure) that goes by a variety of names: the house diamonds, the Stuart Tiara, etc. Whatever you want to call it, it is the grandest set in the substantial Dutch royal collection, and it houses perhaps the single most important stone in the collection. That stone is the Stuart Diamond, a diamond not without its own set of names (it is often called the Holland Diamond) and with one of those histories so extensive you just wish jewels could talk. The exact origins of the stone are a bit hazy, but it comes into our focus in 1690, when it was bought by King William III and Queen Mary II. William and Mary - he, the Prince of Orange, and she, an heir to the British throne from the House of Stuart - reigned jointly in England. 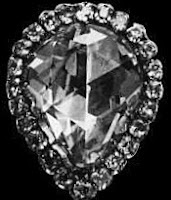 The stone was rough when they acquired it, and Mary shunned the seller's advice to cut it into two stones by fashioning it into its pear shaped, rose cut, 39.75 carat form. Not only is it a large diamond, it is also a pale blue color with a greenish sea tint - a combination which makes this an incredibly rare and valuable stone. The Stuart Diamond lived in England with the reigning couple but was returned to the Netherlands in 1702 after both had died and they had no children; it was determined to be the property of the House of Orange, though Mary's sister Queen Anne of England would sue to get it back (she failed, and it has remained in the Orange collection ever since). 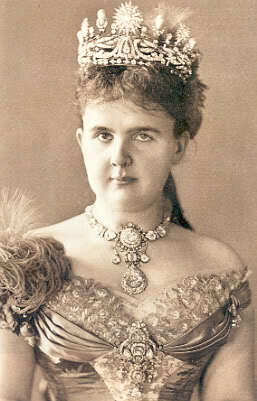 The diamond has had a few documented settings in its life: Mary set it in a brooch, Princess Wilhelmina (wife of Prince Willem V) had London jewelers Rundell & Bridge set it as a pendant for a necklace, and a later jewel inventory recorded it as set in a clasp surrounded by 22 brilliants. In 1879 it once again became a pendant on a necklace made for Queen Emma, the wife of King Willem III. 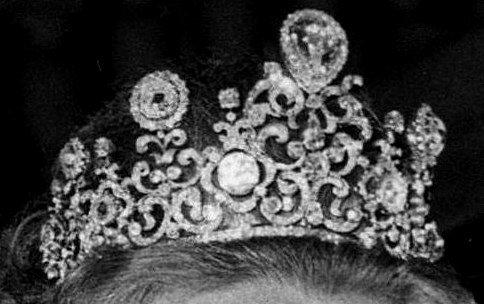 It's not until 1897 that the Stuart Diamond found its current home, in a tiara designed around it. Queen Wilhelmina, daughter of Willem and Emma, had acceded the throne at the age of 10 in 1890; now a teenager, she was to be officially inaugurated as queen the following year. A new set of jewels was commissioned just for her. Eduard Schürmann & Co. made a large tiara from "house diamonds" - it's said to contain upwards of 900 diamonds of all sizes surrounding the showpiece stone. The tiara is part of a set, or parure, of jewels including a huge necklace and a bow brooch so big you might as well call it a stomacher. As tends to be the case with those Dutch royals and their clever jewel collection, you can do a fair amount of switching around with the set - even the tiara has a lower setting available. Bits and bobs from all the pieces can be removed for use elsewhere (recently some of the drop diamonds on the brooch seem to have reappeared as earring pendants, for example). 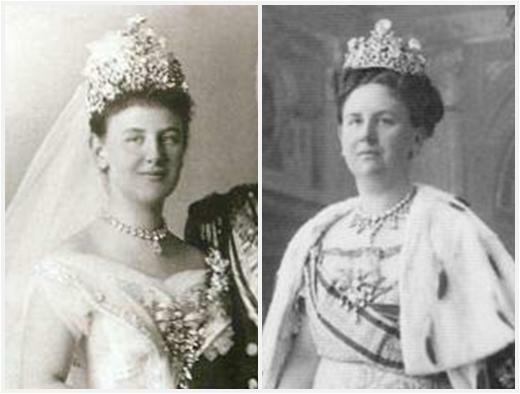 Queen Wilhelmina didn't wear the set all that often, but Queen Juliana had a great appreciation for the sparkle the Stuart brought. On her head it appeared at several major royal events, including the wedding of Denmark's future Queen Margrethe - for a glimpse of some Stuart sparkle click here for the full wedding broadcast and speed on to about minute 34. Juliana wore it until the last years of her reign; it hasn't been seen since then (Juliana abdicated in favor of her daughter Beatrix in 1980). Queen Beatrix hasn't worn any of the three big pieces in this set in her reign. Why not? Well, that's anybody's guess I suppose. The tiara is huge, obviously, and though Beatrix will occasionally air out the major pearl and sapphire tiaras in the family collection, she seems to prefer the small and medium tiaras (it's often repeated that she suffers from headaches, which may or may not be true). She doesn't have much taste for large necklaces, either, though the fact that she's never worn the brooch does surprise me. A few years ago, a rumor floated around that the diadem had been at the jewelers - possibly undergoing a renovation for wear - but rumors are just rumors, and we're still waiting. Me, I'm waiting for my girl Máxima to come through some day. I know she can do it. What do you think: too much, or never enough? Update: Máxima did indeed come through. 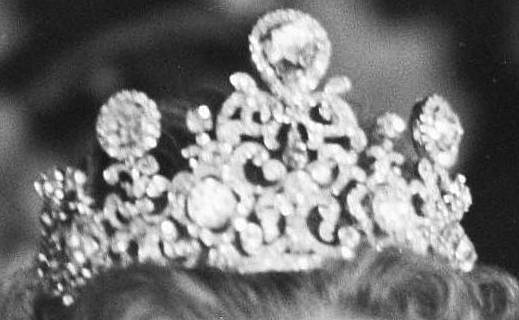 She wore the Stuart Tiara for the first time, in a smaller setting, in 2018.